The Music Theory website directed me to this app as one of the things for practicing, but there’s nothing for practicing notes, keys, etc. on the app - only explanations. I’m a bit disappointed in it. What can I say, this app is clean and easy on the eyes. Excellent as reference when you forget things, and as a learning tool the way it moves the explanations with visuals and corresponding sounds is very logical, also makes it easy to understand the lessons. Literally all that one needs in a very comprehensive package. Only gripe is that it doesn’t allow display of bass clef only treble clef. I haven’t gotten too much into the app, but after a week into having it - it seems pretty epic. I am rusty and brushing up on music theory. This is an excellent app. I am a beginner in music and so far I have learned a lot just from reading from this app. I do wish it had a quizz at the end though. Thank you! I can once again view lessons with my iPad on its side. Back to 5 stars! I am very impressed and pleased with this app. It is worth the price. It does an great job teaching a solid foundation in music theory. It has a very simple user interface, and looks very nice. I would recommend this app to anyone learning any instrument. The only thing I wish it had is a few more lessons, but who knows, this may come with future updates. Overall a worthwhile purchase! Best music theory app I have downloaded. It is very detailed and easy to understand. It also offers a lot of reference charts which are extremely helpful. Fantastic app for beginners in music and a great refresher for anyone who has been away for some time! By far the easiest and best app for anyone to learn music theory. I love it! This app cleared a lot of things up for me that I didn't learn even in class. A great resource for quick reference. Useful application. As a total beginner this application has a lot to teach +It has lots of lessons, I've only made it through three or five out of about 39. -It doesn't have a position save or favourites. +Uses sound and moving diagrams to explain. +Concise wording. +Organized by category of music theory, e.g. "Basics," "Rhythm and Meter," etc. Easy to understand and very resourceful: An excellent tool. It's apps like this that make the iPad worth every dime. Great great app for learning! Very good music theory tutorial. The subject is presented in a clear and concise format. The illustrations are excellent. Don't let the dimmed audio icons confuse you. For lessons that have audio, the audio icon is enabled. I'm not sure why there needs to be a dimmed audio icon at all, but that is a very minor consideration. This is one of the best educational apps I know. As a music instructor, I usually take students who have some background in theory or expertise at their instrument. Branching out to a new student who wants to learn how to read standard notation, I wondered how to easily and systematic start from the basics. 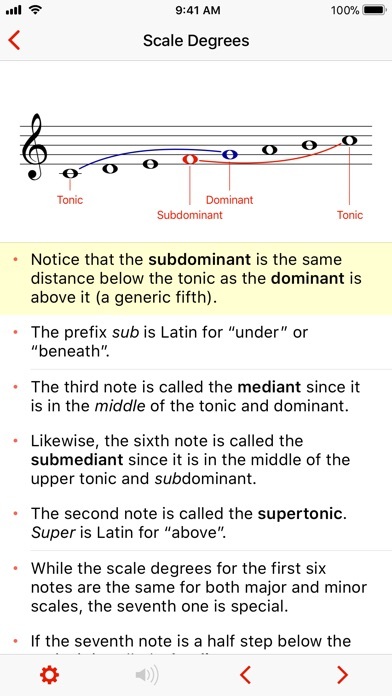 After reviewing the material on musictheory.net, I am working in conjunction with this app because it is so fantastic and easy for my students to understand. I will be downloading the Tenuto app as well soon to have the exercises available. Great product! Thank you so much for being so concise and easy to follow. The perfect way to learn basic music theory! -Jonathan A. As a theorist, I would recommend this application to any musician looking to brush up on theory or beginners starting to learn. By far, this is the best music theory app. Great for brushing up on some theory while just hanging around. Highly recommended. Using this app along with its practice counterpart Tenuto has allowed me to brush up on essential skills while also learning some new theory. These apps are helping me to become a better musician. Highly recommended. Music theory in a simple and well thought out design. It's an amazing app! I bought to help me in my music theory course and believe it or not, it explains thing a lot more clearly than my book. The visual aids help me a lot and it's very easy to use! I recommend this to anyone starting out with music! Best bang for your buck! For a penny-pincher like me that's a high compliment. I detest theory but with Tenuto, the counterpart for Theory, I have a way to both learn interactively (on Theory) and put that learning into practice (on Tenuto). Maybe now I'll actually get somewhere, and that's a very good thing since I'm just beginning to teach piano! :-D Keep it up! I really like this app. It gives you a wonderful introduction to reading music and theory. I would recommend this to any beginner or seasoned vet looking to refresh! This is great general knowledge for those seriously pursuing knowledge and also for non musicians looking for foundational understanding. Great job! I just purchased this app and it isn't working. Please provide a working update. 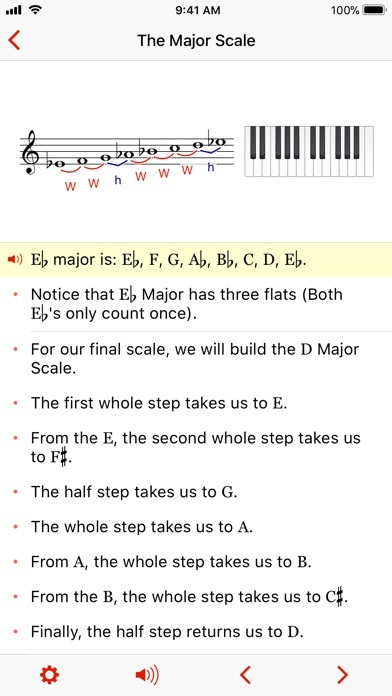 This app is the best in the store for understanding,y and comprehensively explaining the mechanics and structure of music writing so one can begin understanding sheet music and effectively sight reading piano music. This app saves me huge amounts of "lesson time" and speeds my learning with clear understandable illustrations and very effective drills. Congratulations on a super app. I didn't get into music theory until I got a guitar on a whim, then I wanted to try to actually learn music as a side thing, and now for the first time I feel like I actually know a little something about music. Only thing I would add to the app is something that you already have on your website (where I learned from, I downloaded the app and it's sister tenuto) is the pop-up piano that helped me figure out scales (I never learned piano so it was easier for me to visualize this way). Otherwise, thanks for you hard work! The theory lessons are spot-on: I think it could have spent a little more time on basic chord construction before leaping into modes, where it starts getting tricky very fast, but maybe that’s just my own weaknesses speaking. At any rate, for less than a latte at Starbucks, I got some tight lessons that gave me the basic vocabulary to get more help from other musicians as well as make sense of music theory articles on Wikipedia. Certainly less than a course at a community college, to say nothing of private lessons. Very well translated. couldn't be more clarified! This app has some straightforward music theory lessons. This is a good compliment to the Tenuto app by the same developer which has exercises so you can practice the theory you learn. I would have liked to see both apps bundled together to make this a 5 star app, but still very nice. 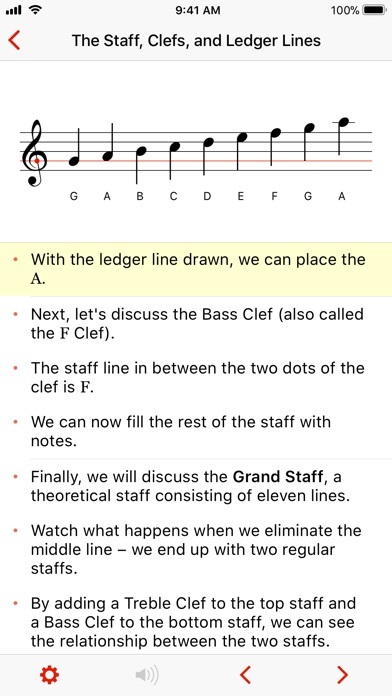 Whether you're just starting out or you have a good deal of experience, this app is a wonderful resource for getting a better understand of music theory. The real wonder of this app is in it's simple teaching interface. As you progress from slide to slide, there are subtle animations that aid in comprehending scales, time signatures, chords, etc. This app makes it easy to learn and makes the overwhelming subject matter easy to digest. I love it, and I hope the design inspires other educational apps beyond just music, they really nailed how a learning app should function. Also, the Tenuto app from the same developer has some cool "mini-game" training tools so you can apply the theory into practice. As a musician and songwriter I've found both apps have enriched my writing style and changed my approach to compositions. I'm an amateur who has always wanted to learn some basic music theory. I went through many lessons online and decided to buy the app -- both for future reference and to support these folks, who did a lot of good work. I learned a lot and really enjoyed the lessons. Beautiful minimalist animation accompanies equally minimal but surgically precise explanation of the fundamentals of music theory. I learned a bit 30 years ago. This brought it back and put me ahead many paces in about three days. Great reference source, too! This app is the best of the best. Very easy to understand and VERY affordable. This is more efficient than buying music theory lessons. ThankYou so much for such an extraordinary app. Gonna be honest this app, in addition to the website, taught me all the music theory I know and it was made so simple and easy. Thank you for making it easy for beginner musicians to learn this. I hope you guys add more stuff soon though. Now I feel smart and very sharp (not pitch) when it comes to music. This app has cleared up a lot of my confusion I've ever had about music theory. I love the study material; but it just feels incomplete without any testing to put your newfound knowledge to work. I never do reviews, so this must prove that this is an awesome app!.. This app is very easy to use and is very easy to understand. It provides very helpful examples with visible keyboards and staff's with highlighted notes to help you understand the lesson being taught. At the very end if each lesson it gives you recaps and guides to help you remember. I love this app and would recommend it to anyone!!! Great companion to Tenuto. All u need. Amazing animation, sound and descriptions! This app has finally made learning music theory easy enough for me to be consistent and make progress. I am so grateful for it! The app is fluid and intuitive as well as feature rich. It is obvious that the developer(s) put a lot of thought and effort into it. You will not learn anything you wouldn't have learned from a book. The "app" is nothing more than a glorified document reader. Save your money. iOS 7 update is awesome! I love this app because it has helped me understand music theory so well. It's worth it! As a total beginner this app makes learning music theory easy and fun. I never thought I would grasp music theory this easily. If you're looking for an enjoyable way to learn music theory this app is it. I highly recommend this app. I just downloaded this app onto my iPad Air 2, but audio controls are greyed out and unavailable. Very easy to use to understand music theory. Interactive as well. 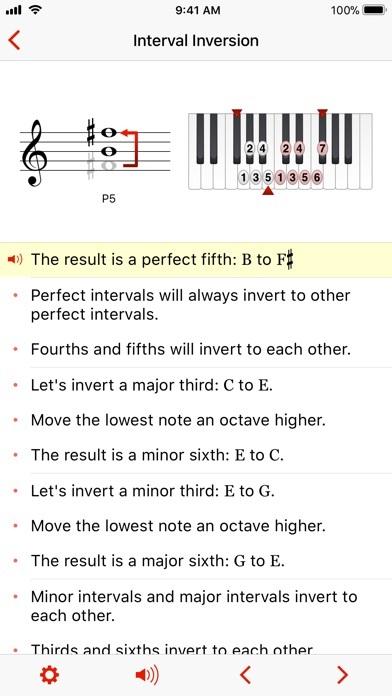 One of the most advanced apps I've seen on music theory. I am truly amazed by the quality of this app. Well worth the money. I have learned so much here and I feel as though I can really take music to the next level. I have one suggestion, however. It is tough to retain all of this knowledge without having a good way to practice some of these lessons. I understand that there is a sister app, Tenuto? 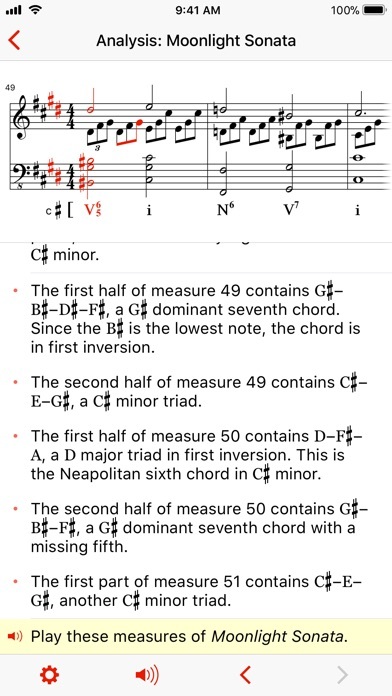 I would be one hundred percent more satisfied if you released an update for this app or Tenuto that included exercises identifying chord progressions, practicing things like the more complicated triads and such; the vocabulary is very hard to retain despite how well the lessons were put together. Thank you for your hard work! This app is a great kickstart into music theory! I've used this for a couple weeks and I've already have improved in my musicianship and overall understanding. Thanks for this great app!! The only thing that is missing from this is more lessons! Keep going :) I hope to see more added in the future. More integration with Tenuto app would be good, so after a lesson you are sent to Tenuto for practice. Or within this app it would be great to have a test section for analysis and identification on things not covered in Tenuto. Never knew how easy it was to learn until I got this app. Everything is put plain as day in front of you and everything is there for you if you need to return and relearn anything. Easy and quick!!! Love this app! Music made easy! Love it! Just wish it had the exercises like on the website so I can train my ear. Love this app. A cheap way to learn the fundamentals of music theory. This app is just information. I am looking for something for my tweets to practice theory. This is not it. Nicely done. I like it. One disadvantage is I can't print at all. Would you please add that feature in the next upgrade? I LOVE this app, it's taught me a great deal of theory that I had a hard time comprehending myself. And I'm sure everybody else has said in a review, the only thing that'll make this app more great is more lessons as well as having a bit more detail/explaining! Can't wait for an update on this app! Keep up the good work guys! Tired Of Confusing Theory Books? Buy this. Clear and precise music theory explanations. Music Theory has always confused me, but this app's visual design/animation is very helpful along with the material presented. Buy this $3 dollar app! No need to pay for tons of theory books. Great for brushing up on beginning theory lessons. Concepts are well explained and illustrated. Incredible resource for theory students. The absolute best music theory app out there. Nothing else comes close. The information presented is very clear and easy to understand with both visual diagrams and sound. The app starts with music theory basics and takes you step by step up to advanced music theory, harmony, and analysis. Everything is packaged in small, easily digestible chapters. The only word of caution, the diagrams in this app are very keyboard centric. If you are a pianists, this app is perfect for you. If you play a non-keyboard instrument, a little knowledge of the keyboard layout will be helpful to get all of the benefit from this app. As a person who has taken music theory before in college, I think this app effectively teaches enough of the basics of music theory. It can get a little complicated I think to those who don't know music theory before, but its great as a follow up for me because Im using this as a resource to teach music theory, myself. You don't need music theory to play an instrument, but if you want to go far in learning you'll definitely need to learn some music theory and this app helps do the job! Great tool for theory review. Easy, beautiful, relevant, and effective. This app is really helpful . Simply put for my simple mind . I have read a lot of theory books and have taken classes in school and never really grasped the concept . My daughter graduated from music college and I had a hard time understanding her way of teaching it to me . I love this app !!! Suggestion .... Could you make the note duration portion of the lesson have a tone when individually reviewed in relation to the note duration itself ? Like whole note .... Mmmmmmm, half note .... Mmmmm ect. .... Thanks for the app !!!! ... needs to incorporate guitar theory, not just theory demonstrated on the piano board. Where is the Circle of Fifths? Where’s is the circle of fifths?